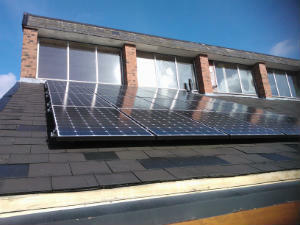 Hasbury Christian fellowship is committed to reducing energy consumption where possible and feasible. The main church building was erected in 2011 to very high energy efficiency standards. The rear part of the building, erected in the 1980s has also undergone some improvements. These factors, together with our new solar PV installation, mean that our combined old and new buildings have achieved an Energy Performance Certificate and DEC rating of grade C, which is good for a large commercial type building. We continue to investigate ways of reducing energy use and continue to carry out further improvements. March 2014 – A section of the roof which was found to be inadequately insulated has now been brought up to current standards. As part of this work, a space in the roof over the office has now been made into usable storage space. Some intermediate floor voids have been filled with insulations and gaps sealed to reduce draughts and several gaps in the ceilings which vented to the outside have been sealed. Next – thermal imaging survey of the rear building to highlight further problems. September 2014 – back draught shutters fitted into all extraction ducts to eliminate wind blowing through ducting. October 2014 – Rear foyer lights changed to LED for maximum efficiency. 1. Financial. Battery cost is still quite high and they have a limited number of charge/discharge cycles in their life before they need replacing. Calculating the quantity of kWh of electricity saved by the batteries during their lifetime against the cost of the batteries, each kWh saved costs about 15p. Compared to the cost of 13.11p to buy the electricity from the national grid, battery storage is currently financially pointless. 2. Ecological – Firstly, a lot of energy is used to manufacture batteries and at the end of their life, although much can be recycled, there is still an issue of disposal of hazardous materials. Secondly, feeding our excess energy into the grid during the day reduces the demand on the grid and reduces the amount of fossil fuel burnt at power stations. So, for the moment we shall continue to run our system as it is and continue to invest in energy usage reduction. The Centre for Alternative Technology has some very useful information about PV energy and many other topics. Have a look! December 2014 – We have now replaced the last of the halogen lighting outside the building with LED PIR controlled floods. ALL lighting on site is now low energy. – We have had our energy usage analysed and have been issued with a DEC Certificate, achiving a grade C which is good. At the start of 2014, we set ambitious targets for energy reduction. This has been difficult as the building has seen an increase in usage over the previous year, but improvements to the building and its equipment still managed to return a 4.5% reduction in electricity use. Unfortunately, gas usage has increased by 11%, largely due to increase in usage of the buildings. During 2015 we will explore ways or reducing heating costs: – avoiding unnecessary heating and improving insulation in the rear building. The later will not be easy given the nature of the building and the cost of implementing improvements. However, our aim remains, where economically viable, to achieve grade B in the EPC and DEC certificates.